We are pleased to announce the forthcoming 2018 Jockey Club Student Village III Annual Sports Tournament which was sponsored by Lap-Chee College and collaboratively organized by all 4 colleges. We are delighted that by joint endeavour, this 2nd JCSVIII Annual Sports Tournament is made possible. We will be hosting games for 6 sports in total, namely Football, Basketball, Volleyball, Table tennis, Badminton and Tennis. All games will be played on weekends starting from 24th of March. Different sports will have different formats and timetables. Please check out the following links for schedule, format and registration. We warmly welcome cheerers and audiences to support and cheer for your respective college teams or individual athlete. For general enquiries please contact Saksham (saksham9@hku.hk; 5517 2434) and Ibnul (ibnulalam21@gmail.com; 9230 7900). 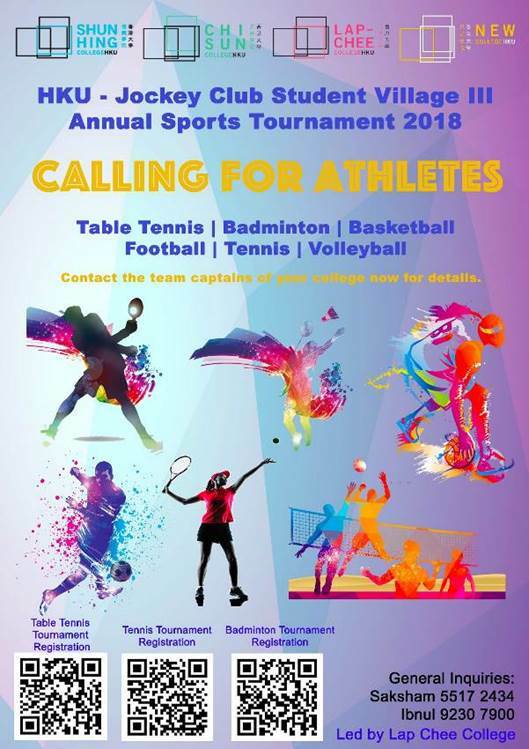 We attached the poster of 2018 JCSVIII Annual Sports Tournament for your kind reference.